These are lyrics by The Bouncing Souls that we think are kind of funny. 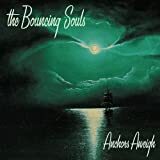 The Bouncing Souls', "You're So Rad"
Actually, the whole album is pretty funny! I can't listen to this particular track without laughing though.